A successful closet laundry room conversion is a great way to get more function and convenience from space you already have in the house. Unfortunately, most people think of the idea as too far fetched or just a big remodeling nuisance. Okay, it will require a good amount of elbow grease but that doesn’t make it unfeasible. In fact, this is a smart way to get more out of an underused space. There are different reasons to do a closet laundry room conversion. First and foremost is convenience; especially if you’re tired of lugging laundry from one room in the house to another. (Or, from the garage or basement to other rooms.) Then, this is a terrific option. Because, it places the washing machine and dryer in an easy to reach space. 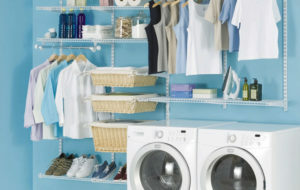 Another big reason to do a closet laundry room conversion is to increase the salability of the property. Since it makes the house more user-friendly so-to-speak, it’s a wonderful marketing tool. And, it does free up a little space in another location. Meaning, you can use the former location for another purpose. For instance, swap spaces and you don’t necessarily lose anything from the transition. Measure the inside space. Before you move one single appliance or even empty the closet, do yourself a big favor and measure the space. Measure at least twice, noting the width, height, and length. Then, measure the appliances, plus the space between the washer and dryer, as well as the distance between the appliances and the wall. Install water and drain lines. Unless you’re a skilled, licensed plumber, hire a professional to install a water supply line and drain line. This must be done carefully so it doesn’t cause water damage inside and/or around the space. Fit the space with power outlets. You’ll also need the right size power outlets for both the washer and dryer. Hire an experienced, licensed electrician to install the proper outlets so you can enjoy the convenience right away. After finishing the closet laundry room conversion, you can easily dispose of the mess. Just phone 800-433-1094 or visit Junk Garbage Removal.